Thanks to this interview over at Newsarama, we can take a look at the drop-dead gorgeous and absolutely stunning young lady who will be playing Hawkgirl this season on Smallville, Sahar Biniaz. Born in India, Sahar Biniaz grew up in Iran and is now a Canadian citizen living in Vancouver, B.C. She is the youngest of three children and works as a professional actress in Film and Television. Recent credits include a recurring role on Blade: The Series and a part in the new film, The Watchmen. Sahar loves the craft of creating characters that must overcome obstacles, her passion for acting has also taught her about her own emotions and potential. Sahar's ultimate goal is to become a renowned and respected actress whose work and filmmaking brings awareness to humanitarian and women's issues. Obviously she won't be as dolled up as Shiera/Kendra, and the hair will need some coloring, but man, check out her eyes, nose, and chin! She looks like she could stare right through you even before she picks up the mace! She has just enough of an exotic look to really sell the countless resurrections the character has experienced, and her beauty is more than enough of a balance to Michael Shanks gruff Hawkman. Definitely looking forward to seeing her on the small screen! Found this image on robs! Aquaman Shrine, and I just had to laugh. What a mashup! The Superman/He-Man one at least made sense considering the early MOTU comics, and the Lex Luthor Skeletor one was a natural extension of that, but this is silly. The truly ironic thing is that of the two sets I am more likely to buy the Aquaman/Mer-Man one -- I already have the Hawkman toy, and Mer-Man is a favorite of mine! Go figure! Of course if they had packed Hawkman with the super-awesome Buzz-Off instead of Stratos, I'd be all over that like a frog on a lily pad. Image: Toyfare preview of DC/MOTU two-packs, 2010, image obtained from The Aquaman Shrine. The first-ever meeting between DC Comics' Justice League of America and Teshkeel Comics' the 99 continues! 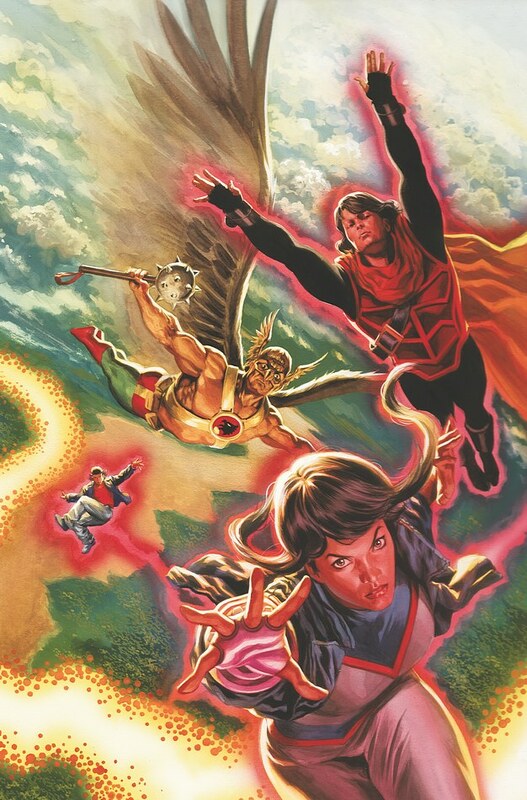 Hawkman joins three members of The 99 on a flight to Brazil where earthquakes and devastation suggest the existence of another Noor Stone and another new addition to the 99's team! Can Hafiz harness the stone's power before he destroys everything? And why is Firestorm acting so . . . oddly? I've said it before and I will say it again, I don't know The 99 from The 100, but I may give this miniseries a try. I am a sucker for international heroes, and this group seems to be a wide and varied lot. Part of me really just feels like this whole thing is a promotional gimmick... you know, moreso than every other promotional gimmick which DC and Marvel publish. Take that comment as you will. In any event, good to see Hawkman playing a big part in what (I assume) should be a high profile DC book. Image: JLA/The 99 #3, 2010, Felipe Massafera. 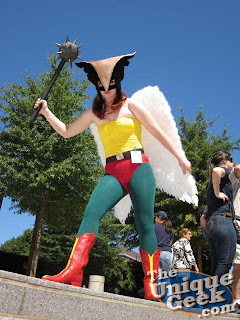 From everybody's goof friend Shag comes this image of a Hawkgirl cosplayer from this year's DragonCon convention in Atlanta, GA. I like the angelic wings, which are probably a lot less unwieldy than your typical wing harness. Her cloth helmet is cute, and the primary colors on the costume really pop. It's rare that a tube top is an appropriate fashion choice, but here it works. The bustier look is better on a more voluptuous model, but this suits her body. Speaking of which, her arms and legs are nice and trim, adding to the look. Her boots are probably the best individual element of the costume, although the morningstar is a nice touch as well! You can also check out our heroine battling her Black Lantern counterpart! Yikes! You can head over to The Unique Geek or flickr and see the literally hundreds of pics which Shag took at the show... just be sure to have some time to pore over them all! Image: Hawkgirl cosplayer, 2010, image retrieved from The Unique Geek. Stumbled across this custom build up quite by accident, while looking for a good image of Adam Strange to show my coworker who was on a conference call with a man named... Adam Strange. Sometimes this stuff writes itself, folks. Anyway, as a sometimes-modeller myself, I really liked this piece for the kitbashing elements of it. The base is nothing overly complicated but it adds a lot to the finished look, and I really like the exhaust plume coming from Stange's jetpack. The details are nice as well, such as Hawkman's Super Powers styled helmet and Silver Age chain mace. All in all a very nice piece! 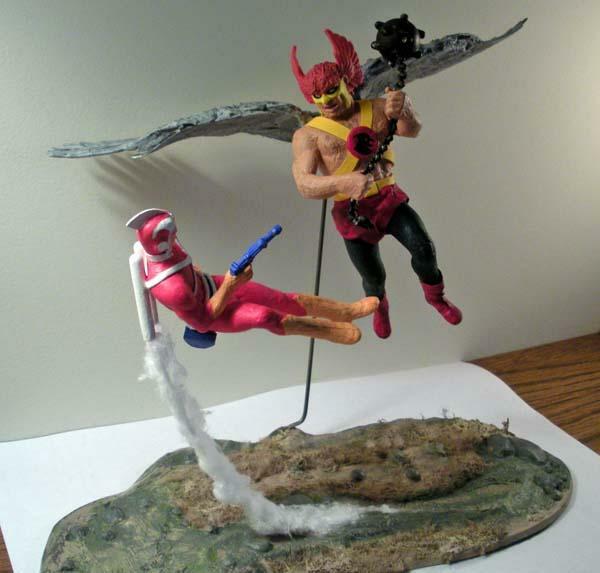 Image: Hawkman vs Adam Strange Custom, ??? ?, "claytonemery." As we head own to our local comic shops today, what Hawkman or Hawkgirl stuff can we expect to find waiting? Let's take a look and see! Brightest Day #10 -- We know why they are back... sort of. How the Hawks will escape from Hawkworld, what is the connection to Star City (if any), and just who the heck is Queen Shrike really? Lots of questions, hopefully some answers. Can you believe that we are nearing the halfway point of this series?! Justice Society of America Special #1 -- Didn't we have a Justice Soceity of America Special #1 last year? Shouldn't this be #2? Anyway, at this point Hawkman is so far divorced from this version of the JSA that I doubt he will show up, but you never know. Plus some classic teammates like Alan Scott and Jay Garrick should be there. Summary: In Germany, Carter Hall spends time reminiscing about his past lives, including one in the city of Lubek. He was known as Koenradd von Grimm, and was the son of a blacksmith who was one of the most respected me in the city, helping turn it into one of the most powerful in the region. While in a bar, Carter witnesses a man named Jonas get into a drunken brawl before being sent home by his brother, the bartender. His brother apologizes for Jonas' behavior, saying he has not been the same since his wife died. Later, Carter is at a graveyard when he runs into Jonas again. Jonas is sober, and melancholy over his actions. He and Carter talk about losing loved ones, something our hero knows all too well. Jonas says that the only thing he can imagine worse than losing his wife was to be if he never knew her at all. Carter is touched by Jonas' revelation and considers it, thinking again about his many lost loves. He takes a rubbing of Koenradd's gravestone, which he adds to a collection of similar rubbings back at Stonechat. Then, a call comes in from Ray Palmer, who extends a dinner invitation to his friend, which is accepted. Review: Unsurprisingly, we have a quiet, introspective issue after the blowoff of "The Thanagarian" (see Note below). Luckily, Hawkman's many past lives is fertile ground for reaping not only fill-in stories but also these quieter tales of reflection. Not much to say here other than Jose Luis Garcia-Lopez's art is fantastic... it's too bad we only get to see Carter in his gear once, and then it is a cold weather version rather than his normal uniform. Still, a diverting read and helpful to building the resurrection mythos which permeates this volume. 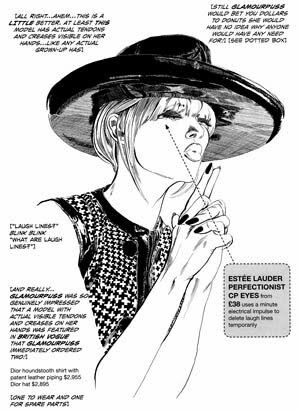 Note: When I started this review I didn't realize that I had never written up my review of #17! So expect that one pretty soon. Hopefully. 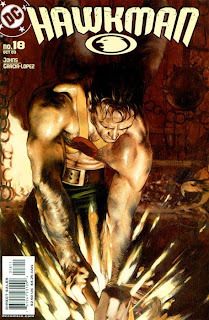 Image: Hawkman v.4:no.18, 2003, John Watson. Well, I think this might be a first: a piece of DC tie-in merchandise which does not include Hawkman or Hawkgirl, but does include Zauriel! I got this image, which was from the promo comic Adventures With The DC Superheroes,from the Aquaman Shrine (thanks, rob! ), and when I saw the winged warrior up top, I assumed it had to be Hawkman. Well, slap me around and call me Susan but it's that angelic guy from Morrison's stint on the JLA instead! 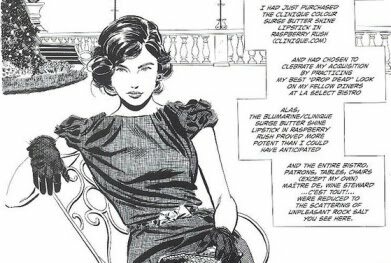 Just hard to believe that Zauriel made a piece of merchandise, especially since if you need a "Z" then you normally go to Zatanna. Image: JLA to Z Puzzle Page, 2000, ??? ?, image obtained from The Aquaman Shrine. Well, there doesn't seem to be any new Hawkman or Hawkgirl stuff coming out this week, so let's take a look at some other DC stuff instead. Adventure Comics #518 -- The lead story, dealing with Superboy and the Legion of Superheroes, isn't really my cup of tea. I read the Legion for a spell when Supergirl was hanging out with them, when Tony Bedard was writing them, but they are just not my thing. The backup, however, features longtime Hawkfriend Ray Palmer, The Atom! I am not going to spend $3.99 for just the backup strip, so hopefully DC will collect Lemire's stories in a trade. Doom Patrol #14 -- I know I have raved about this book before, but it deserves repeating. Giffen and Clark (along with the occasional help on art) have produced the team's best chance for a long-lasting series since the Morrison days. And frankly, this stuff is a lot more accessable and enjoyable. I never cared one lick about this team before this series, and now I just got done buying the first Showcase volume. Justice League of America: Team History HC -- The first collection of James Robinson's JLA stories is here in hardcover. I was among the minority of online fans who earnestly and honestly enjoyed Cry For Justice, so the only roadblock to my buying of Robinson's Justice League was the budget. So I am definitely interested in checking out this volume. Plus I hear that Atlas, whom I really dug in both "The Rise of Atlas" and "New Krypton," makes an appearance. Remember that Hawkman plushie which Rick sent me a picture of a few weeks back? Well, fret no more, because our plush Pinioned Powerhouse now has his partner in law enforcement as well as in love at his side in the form of this Hawkgirl plushie! I am not sure how a plushie doll can be called a "figurine," but whatever; the fact that it is a claw grabber game prize of Hawkgirl is indicative of the fact that her profile got a huge boost from her turn on Justice League. At this point, if a live action JLA film was actually made, I would more readily expect to find one version or another of Hawkgirl instead of Hawkman in it. "Kids ages 3 and up?" Cripes, if I have a daughter she is going to be snuggling this in her crib, folks. 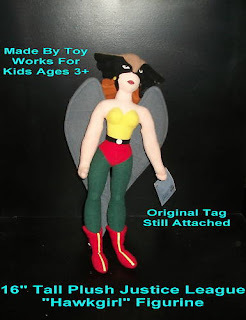 Image: Hawkgirl plushie, 2010, image retrieved from eBay. 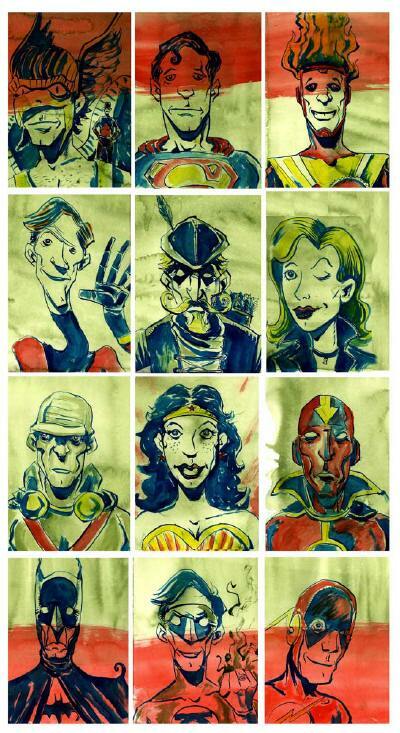 Going to start the week off with a little piece I swiped from Frank over at the Idol-Head: A Jeff Lemire rendered image of the Justice League! I seem to remember Lemire doing something like this before, because I have a vague recollection of Barry Allen as someone's nerdy uncle. But that notwithstanding, I like this goofy, thin, gangly take on Hawkman, with a little Atom hanging out on his shoulder. Katar (I guess?) has a nice little smile which suggests more of a sort of Silver Age helpfulness than a Modern Age bashiness. I also dig that he added the chest stubble in there as well. The whole crew looks suitably amusing. I like Green Arrow's Rollie Fingers style moustache, Batman's anorexic look, and the Manhunter's excellently oversized brow. All in all a great piece. Image: Justice League, 2010, Jeff Lemire, image retrieved from the Idol-Head of Diabolu. Well folks, I am heading out of town with my wife and son to visit family for the Labor Day holiday. So I will be offline until most likely Tuesday, when posting should resume. Everyone have a happy and safe Labor Day! From The Source, here's the scoop on The Music Of DC Comics! 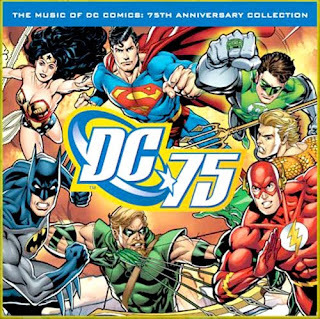 It starts in 1941, with the theme to the classic Fleischer Superman cartoons and moves through the years, including shows and movies like BATMAN, THE NEW ADVENTURES OF SUPERMAN, LOIS & CLARK, BATMAN BEYOND, SMALLVILLE, THE BATMAN and a ton more, all on one compact disc – with 21 of the 31 tracks available for the first time ever. The collection, which hits stores later this year, is a must-buy for any fan of DC Comics and it's various television, film and cartoon interpretations. Scroll down for the track listing and album art. I know I'll be popping my copy in once it arrives. - Previously unavailable. Digitally remastered. From the Filmation cartoon "Hawkman." Let me just inject and say: WOW! Never thought we'd see this theme song released! - Previously unavailable. Digitally remastered. From the Filmation cartoon "Justice League of America." - Previously unavailable. Digitally remastered. From the Hanna-Barbera cartoon "SuperFriends." - Previously unavailable. Digitally remastered. From the Hanna-Barbera cartoon "The All-New SuperFriends Hour." - Previously unavailable. Digitally remastered. From the cartoon "Justice League Unlimited." You have to love all the team-ups! I have always dug the bombastically corny Superfriends music. - Previously unavailable. Digitally remastered. From the Filmation cartoon "The Atom." Friends of Hawkman: also welcomed! There's a great variety of tunes on this album, which looks like a must for a DC Comics fan. I'll be on the lookout for this one. Image: The Music of DC Comics, 2010, image retrieved from The Source. The guys over at the webcomic Let's Be Friends Again has done us all a big public service by producing this comic strip which explains the convoluted and twisted history of Hawkman! Caution: Snark Ahead. Thanks to fellow Hawkfan Skyhawke over on the CGS Boards for passing this link along to me! He has certainly earned his Honor Wings! 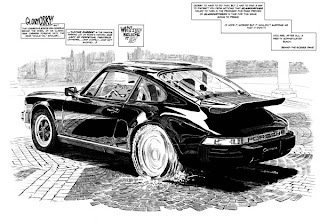 Have a cool piece of Hawkstuff you want to share? Send it along and you too could become a Bearer of the Honor Wings! What sort of new Hawkman or Hawkgirl stuff can we expect to see at our local comic shops today? Let's take a look and see. Brightest Day #9 -- If you read my review of Brightest Day #8, then you know that the Hawks had some pretty major (if head-scratchingly mysterious) revelations, so I do not expect them to play an overly large role in this issue. Still, this is where we go to get our Hawk fix these days, so here you go. Martian Manhunter in Green Arrow's forest is going to be something to see, though!